My friend Trish of Love, Laughter and a Touch of Insanity created a Pinterest challenge, wherein participants actually do/make the things they’ve pinned. She’s been hosting the monthly challenge for a whole year now, but this is my first time to participate. The Pin It and Do It challenge is open to everyone, so join in the fun! I’m signing up at the Pinterested level, hoping to complete 4-7 pins. I feel a little bit like I’m cheating, since this installment of the challenge runs for the month of May, and a couple pins I’ve already done (or at least started), but hey. She said it was OK, and she’s the host. 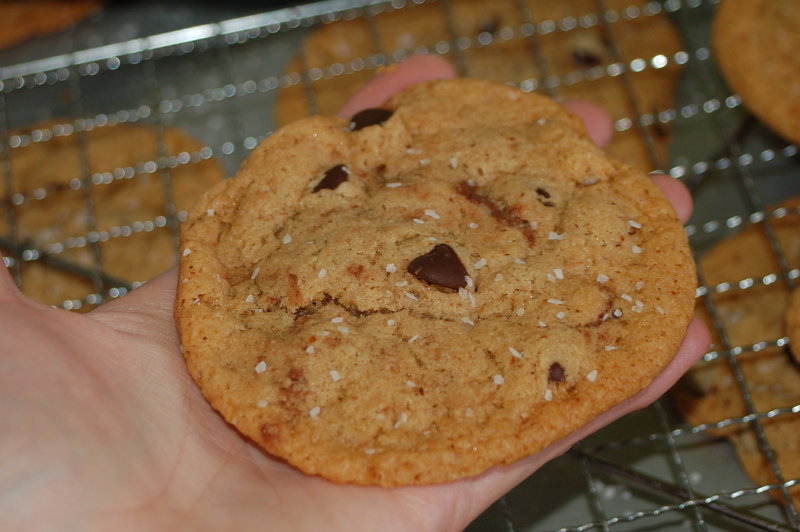 We (and by we I mean my husband, but I found the recipe) made these cookies last night. 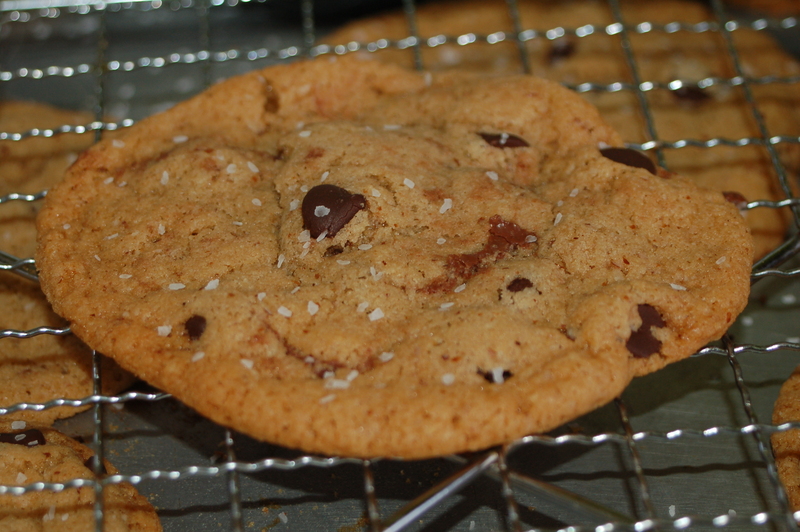 Chocolate chip cookies, but with browned butter, sea salt, and Nutella? How could they be bad, right? I totally didn’t notice that Nutella seepage while taking the photos. Oops. We did make a few modifications, of course. First, we subbed out the flour, to make them gluten free. I think that may be the cause of the giant-ness of them? They spread like crazy. And we didn’t have sea salt, we used kosher salt. Pictured here on my relatively large hand for scale. Now excuse me while I go pin some things I have planned to make/do for A’s birthday party. I also have some projects I pinned months ago for my own birthday party that I’m planning to accomplish this month, too. Lots of party-related pinning and doing planned for this month, over here! The Book Thief is narrated by Death. It’s set in Germany, opening in 1939. Yes, that’s World War II. Liesel Meminger, at age 9, is taken (by her mother) to live in Molching, Germany, with a foster family. On the journey, she steals her first book, even though she can’t yet read. She’s haunted by nightmares of her younger brother’s death. Among other awards, The Book Thief was a Printz Honor Book in 2007. I knew I was missing out by having not yet read this book. I started reading it in 2008, but it was during the read-a-thon, in the middle of the night, and I just wasn’t capable of reading a book narrated by Death in the middle of the night and still appreciating it. Alas, it’s taken me nearly two years to get back to it, but at least I finally have. I found the voice of this book to be wholly unique. While most of the material wasn’t new to me (although a bit of the perspective I hadn’t read before), this was *not* just another Holocaust book. The writing is superb, achingly beautiful. (I feel like I use that phrase way too much …) I also found it quite interesting how most things are fully disclosed before they actually happen — the narrator “spoils” himself. The characters, the bookish elements, the writing — all excellent. A gorgeous book with a heinous setting. I say setting because war is not really what the book is about. It’s a backdrop, sure, and hardly a page goes by without mention of it, but the book is about Liesel, about words. My only complaint (and it’s a small one): The prologue doesn’t really fit the book. After I’d read the prologue, I was sort of dreading this book. But once I got past that, the story sucked me in and the pages flew by. Although this book was first published in just 2006, I’d call it a classic. This is a book that will endure. If you haven’t read it yet, why not? Sure, it’s not exactly short, but it’s also a young adult book, so the pages fly by (well, the fact that it’s a great story helps that, too). You have no excuse. Read it. I definitely want to read more of Zusak’s work — I’m particularly intrigued by his I Am the Messenger. Markus Zusak lives in Sydney, Australia. Read an interview with Zusak at the Random House website. Still want more reviews? 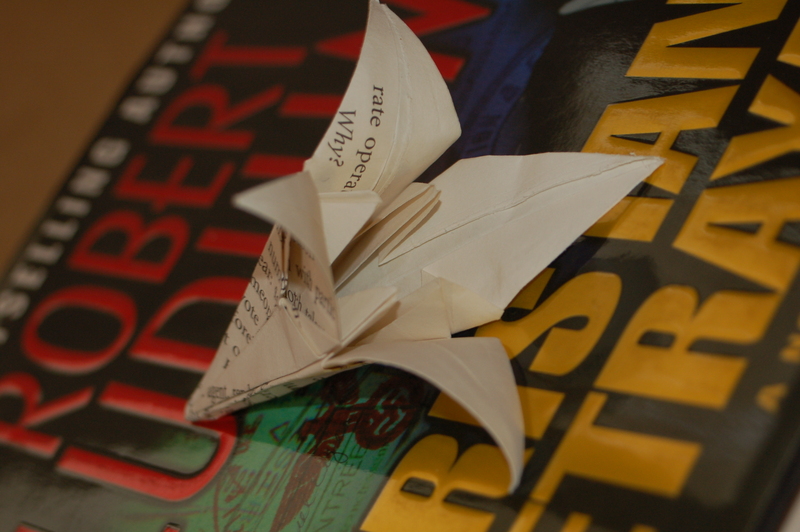 Check out the Book Blogs Search Engine. I checked this book out from the library. I am an Amazon Associate and receive a small commission on sales through my affiliate links. My impetus for finally picking this book up was the Social Justice Challenge; the January theme has been religious freedom. It’s certainly not a stretch to see how this book fits that theme. This is the crux of why we — Natasha, Amy and I — are hosting this, the Social Justice Challenge. And each month, in addition to reading selections, we’re also challenging participants to take action, to do something to counteract the injustice we’ve been learning about and highlighting that month. Why am I a part of the Social Justice Challenge? Well, this is why: I am passionate about social justice. I try to live intentionally, conscious of how my choices and actions impact others. My heart is broken by the pain of others, by the injustice in this world. Join us! Check out the challenge site, which has tons of resources about the individual themes (with more to come!) (and while you’re there, subscribe! ), and subscribe to the challenge Twitter account @read4justice. Well, that wasn’t too hard, was it? 🙂 Since #readathon was already trending when my read-a-thon mini-challenge started, we had an advantage. The highest I saw the #hashtag get was Number 5 on the list; think we can get it higher than that, at some point today? It’s such a rush, isn’t it? The winner of my mini-challenge is Kathrin of Secret Dreamworld of a Bookaholic! Congratulations, Kathrin! I’ll be emailing you shortly.